See It. Touch It. Smell It. Taste It. Live It! The original 1930s manager's house was converted into a guesthouse with 4 double and twin rooms, all with en-suite bathrooms. 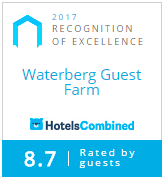 In order to share the natural beauty and heritage of the Waterberg and their passion for conservation with visitors, Harry opened the Waterberg Guest Farm in 1995. A Room Key deposit of N$100 is charged and fully refundable in cash upon check out. All rooms have toilets, showers and basins (one of the rooms also has an additional bathtub). All rooms have their own private entrance leading out to a veranda. The spacious dining room is also located in the guesthouse, along with the comfortable lounge - the perfect spot to relax after a long day outdoors. In addition to the guesthouse, there are four 'bush bungalows' situated 160 meters from the main guesthouse. The truly unique bungalows are built according to the traditional Herero method. In addition to the guesthouse, there are five 'bush bungalows' scattered along the slope of the Klein Waterberg. The truly unique bungalows are partly built after to the traditional Herero method. According to Herero tradition the basic structure is fashioned from wooden poles harvested from non-indigenous invader bush, thus assisting in combating bush encroachment. These are then covered with a mixture of clay from termite hills and "ombumbi" (cow dung) which is applied by hand by the women of the village. While the bungalows themselves are constructed with mostly natural materials, the interiors are decorated in contemporary African design and offer all the modern amenities to ensure your comfort. They also offer the wonderful choice of showers either inside or outside, surrounded by breathtaking views! In the traditional African grass-roofed "lapa" next to the swimming pool guests can enjoy their afternoon coffee or a sundowner. Alternatively they can sit on the wooden deck or around the fireplace and watch the illuminated waterhole as antelope, warthog and the occasional leopard come to drink, and in turn, be watched by the resident family of baboons. Our concept is simple ... a small guest house, accommodating a limited number of guests, set in the midst of a wildlife haven. Situated at the foot of the majestic Waterberg Plateau in Northern Central Namibia is the magnificent Waterberg Guest Farm, a 42 000 hectare paradise of natural African savannah. Your host, Harry Schneider-Waterberg, is a committed conservationist and was instrumental in establishing the Waterberg Conservancy.